This is part 5 of an ongoing community project (see all posts) to help people understand how to get jobs during a recession. 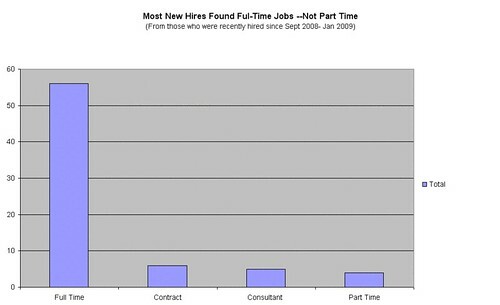 This is just the data from the 71 respondents that got hired since Sept 2008 (since the recession was announced). Although these answers were open ended, I tried to summarize them into categories, and then graphed them as shown above, please note that some of the individuals gave more than one suggestion per answer, and some did not answer at all. 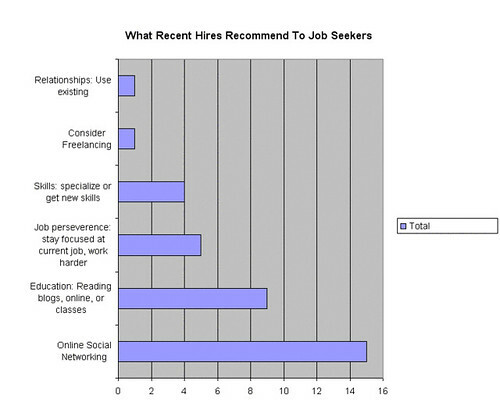 Notice how 9 out of the respondents encourage you to learn new skills by reading online, or by attending classes. This means that 78% of respondents were hired in full employment positions, likely with benefits. Important: In addition to reading my summary, here all the responses that they suggested to those who are seeking jobs –and their observations how the market has changed. To find the other results from this survey, I’ll be tagging the post “Job Survey” and you can click that category to learn more. Resources: See my Web Strategy Job Board, or Job Wire. This is part 4 of an ongoing community project to help people understand how to get jobs during a recession. Don’t change strategy just yet and offer up that you’ll work part time if you really want a full time position. Companies are still seeking full time bodies for long term programs –make sure your resume reflects this. For those seeking part time, consulting or contracting, you should also think about other job opportunities in full time positions. 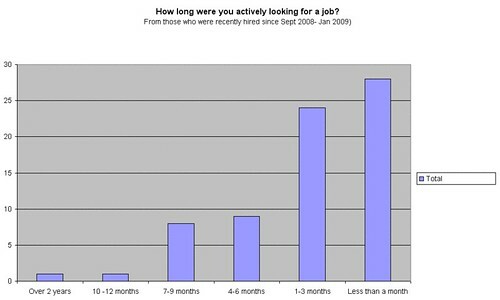 This is part 3 of an ongoing community project to help people understand how to get jobs during a recession. 56% of those recently hired reported that they received “average” compensation in what they considered market range. In fact, there’s some good news as 21% of those recently hired reported that they received “more” compensation in what they considered market range. 14% of those recently hired reported that they received “less” compensation in what they considered market range. This means that 77% of respondents were to be paid an “average” or “more” compensation that what they considered market range. Job compensation rates are still holding up, employers haven’t had the need to cut back on compensation –yet. Job seekers shouldn’t ‘dumb down’ their resume to get in the door just yet, the job market hasn’t fully slumped, at least in the face of compensation. I know of some cases in the last dot bomb where people left their graduate degrees OFF their resume in order to be considered. At some point this will turn over, and people may get hired with “Less” compensation that they feel is market average, of course market average is purely a perspective, we know that you always get paid what you’re actually worth. When compensation does turn south, expect employers to offer barters for increased benefits, or pay-for-performance plans where individuals are compensated for their actual job –not just salary. Job seekers should then factor into their contract a re-negotiation period when the market recovers, and ensure they are compensated correctly for over-performance. 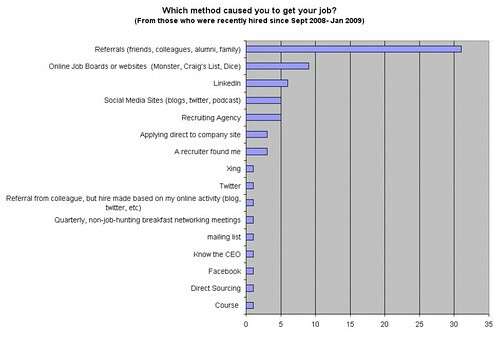 Overall, this combined with the last survey results, really shows that people in this community are able to quickly find jobs, it’s not as bad as it seems –yet. Survey: How did you get your job? Layoffs are among us, even tech giant Google is apparently dicing off a significant portion of their workforce, more layoffs will come over the next year. For those that got laid off (or those that are worried about it, which is most) understanding the skills needed to land that next gig are crucial. One of my goals in this new year is to help support the community around me. As a result, I’m launching a survey to find out how people recently got their job, in an effort to understand the skills, ways to find jobs, and other tips from those that have landed jobs. Please take this survey then share it with others, I will make all of the data public (except names and emails) and will discuss the findings on a site I’ve dedicated to help folks get employed. Thanks to RWW for spreading the word on this survey. Bryan Person helps to read the word too. Do note, I’m doing this outside of my day job, this is simply my way of giving back to the community. Please spread the word on this in order to help others.